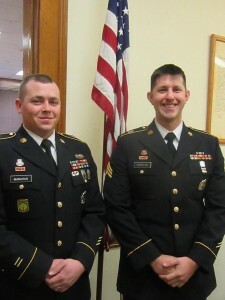 Casey Manahan (above, left) of Wyalusing and Ryan Donovan of Orlando, FL, introduced themselves to the Bradford County Commissioners on Thursday as new Army recruiters for the Endless Mountains – Bradford, Sullivan, Susquehanna, and Wyoming counties. 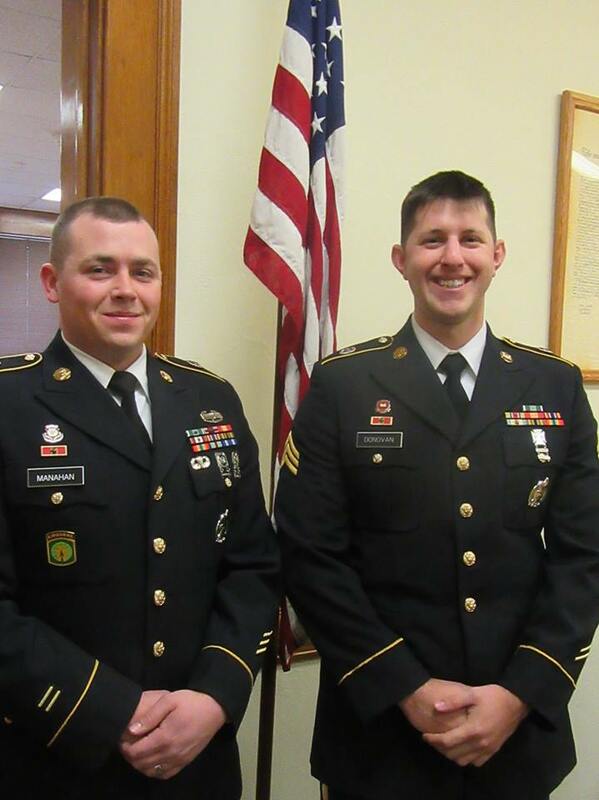 A Wyalusing Valley High School graduate’s dedication to the Army sent him abroad and brought him home to share his experiences and help other young adults decide whether the Army is right for them. 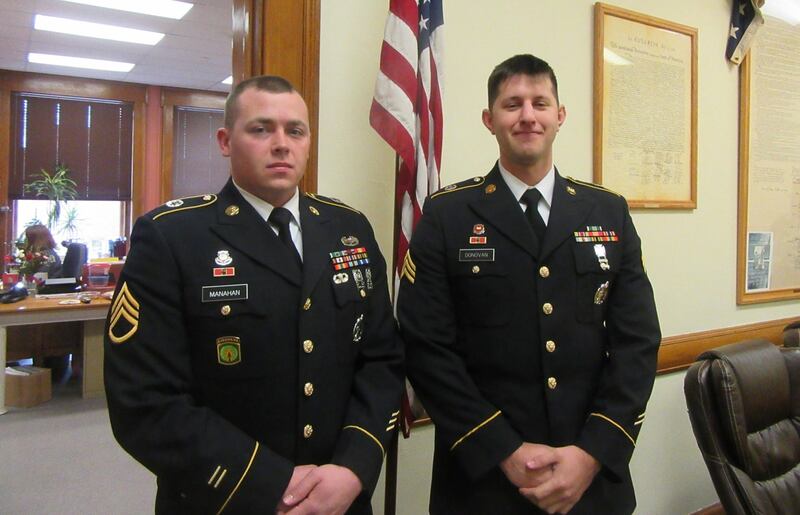 Staff Sargent Casey Manahan grew up in New Albany. He is airborne classified and has participated in training exercises with Afghan police officers in Afghanistan. Upon his return to Fort Bragg, he volunteered to be a recruiter and was first positioned in Wilkes-Barre. He is married with three children. Sargent Donovan grew up in Florida and earned a bachelors degree in public affairs from the University of North Florida. He entered the army as a reservist and was trained as a combat engineer specializing in “urban breaching,” which he described as “blowing down doors” to gain access to strategic areas. Donovan was sent here in October and admits that he has not yet acclimated to the weather. “I’ve been cold since I got here,” he laughed. Manahan is happy to be working closer to home and eager to establish a new office in Towanda. “Our mission here is to guide young men and women through the application process for the Army and Army Reserves,” he stated. The men related that they make sure that potential recruits fully understand the commitment, conditions and tasks involved. “We tell them that they might not like everything that they have to do,” Donovan noted as an example. An official recruiting office is slated to be opened by Jan. 31, 2017 in the Towanda Terrace building at 405 Main Street, suite 105. “We’re hoping it’s soon,” said Manahan, remarking that, in the meantime, they have been working from home, their vehicles or wherever they can find space. Commissioner Doug McLinko subsequently offered the men use of the commissioners meeting room for conducting interviews. Until the new office is opened and assigned a phone number, young men and women in the Endless Mountains interested in a career in the United States Army or Army Reserves may call 570-909-7683 and 570-815-0210.